The age of multitasking needs better narrative history. It must be absolutely factual, immediately accessible, smart, and brilliantly fun. Enter Andrew Helfer, the award-winning graphic-novel editor behind Road to Perdition and The History of Violence, and welcome the launch of a unique line of graphic biographies. 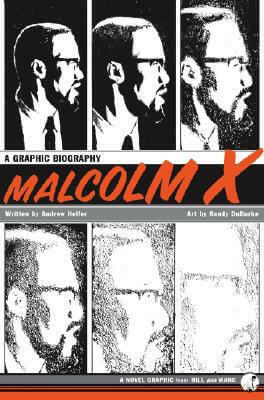 With the thoroughly researched and passionately drawn Malcolm X, Helfer and award-winning artist Randy DuBurke capture Malcolm Little's extraordinary transformation from a black youth beaten down by Jim Crow America into Malcolm X, the charismatic, controversial, and doomed national spokesman for the Nation of Islam. Andrew Helfer, as group editor at DC Comics, launched its Paradox Press imprint and the award-winning Big Books series, and worked on everything from Batman to The History of Violence. Randy DuBurke's illustrations have appeared in The New York Times Book Review, Mad Magazine, DC and Marvel comics, graphic novels, and science-fiction magazines. He is the winner of the 2004 Coretta Scott King/John Steptoe New Talent Award for illustration. He lives in New York. Read ’s description of Malcolm X: A Graphic Biography.